Kashmir is a very important, and turbulent, religious and cultural centre. Famous for its craftsmanship and textiles, the likes of which are to be found nowhere else in the world, ours is a definitive collection of the produce of the looms of the valley. The most tasteful of sarees and jackets, made from wools and silks that are endemic to the mountains, are curated in our textiles section. Another of Kashmir's much-coveted produce is the statement Oriental rug, of which this is a fine example. Having emerged from the local handlooms of the region, it is a panel of sturdy homegrown cotton embroidered with ample proportions of silk to create an object of great beauty. Knotted by hand, the plethora of flowers that could be seen on this took an eye-watering number of hours on the loom. Considerable skill and labour have gone into this to reproduce the picturesque local flora onto this rug. Varying tints and shades of brown, rich deep reds, and the occasional white make for a distinctly earthy palette, while the infusion of a dense azure into the central panel makes for an eye-catching colour combination. 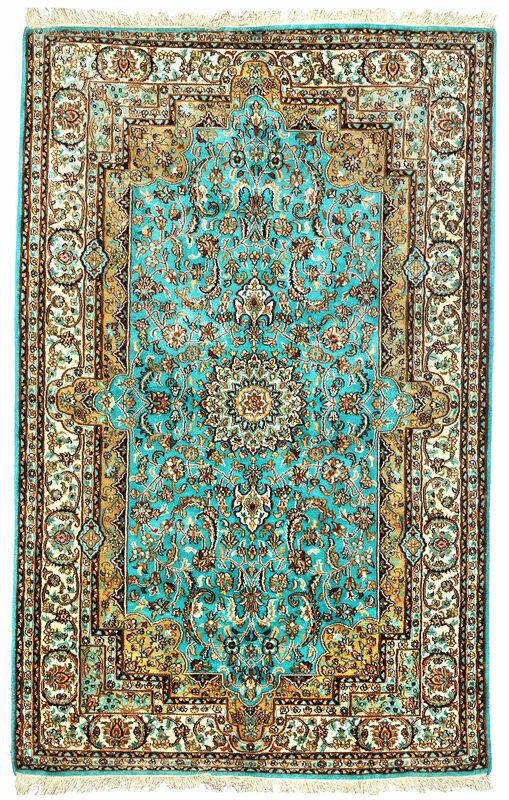 Note the concentric panels and the curves that define them, which are highly characteristic of these famous rugs of the Orient. A miniscule strip of matching azure hemmed along the edges, and short ivory tassels along the breadth, complete the picture.